Gatterdam Industrial's focus since 1954 has provided responsive (24x7x364), quality service at competitive prices. Based in Louisville, we serve Kentucky, Indiana and Southern Ohio. Gatterdam provides a suite of products services for manufacturers, industrials, municipalities and power plants to accomplish their production goals. Focusing on electric motor / pump / gearbox & automation sales, repair, and service. Gatterdam possesses the knowledge, resources and capability to optimize the efficiency of your plant via Inventory Optimization and Preventive Maintenance. For more infomation about the Vision, Resources and Value that Gatterdam Industrial Services (GIS) provides please contact us at (502) 776-3937. For service information or quote requests please don't hesitate to Submit an Online Information RequestÂ and we will contact you within one business day. Our commitment to timely, customer-friendly service includes 24 hour emergency service, an incentivized quality focus and the ability to service most motors via the largest manufacturer network in the region. More about our Motor, Pump, Gerarbox and Automation Vendors. 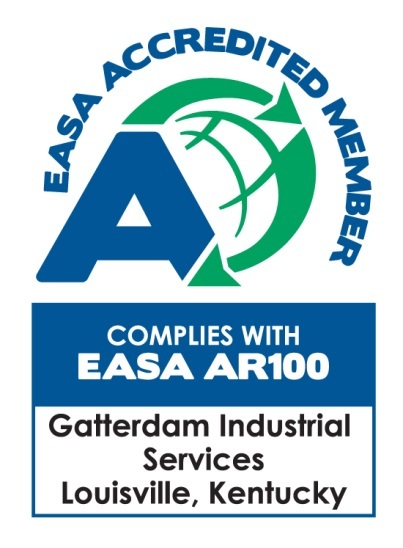 Recently, we became the 59th company in the world out of more than 1900 service centers to become EASA Accredited.Â Click HERE to learn more about this commitment to quality electric motor repair. Login to access order, job & account status, plus history.